As with locomotives, commercial trade support for British Nn3 rolling stock is scarce. There are just two or three kits available for Nn3. The two I have used most are made by Peco and they have to be ordered specially from the Technical Advice Bureau down in Beer. These are the box van and open wagon. Unfortunately, they both come without wheels, but Marklin wheels can be used quite successfully and these are available as spares from Marklin dealers. Both wagon kits are injection moulded plastic which is a great advantage as it's then easy to work the various components up into other variations in order to inject some variety into the wagon fleet. Looking at the exploded view of the kits, it'll be apparent that they are very simple indeed. The only addition I make to the basic kit is to use some turned brass axle bearings (available from the 2mm Scale Association) instead of running the Marklin axles directly in the plastic sideframes. This had two advantages - it makes the axles very free-running and also takes up any end-float on the axle. The actual mouldings are quite thick, which is not an issue on the van, but on the open wagon, it could be a problem, so the designer has cleverly made the sides tapered. The open wagon also comes with a cast whitemetal load of ballast, but this is way too heavy and in any case, who wants a train of identically loaded wagons? Couplings are a simple etched brass combined hook and loop affair which work well, but naturally prevent any sensible automatic coupling and uncoupling. There is plenty of room under the wagon for fitting a Microtrains body-mount Z/Nn3 coupler, but I've preferred to work out my own solution, more on which later. The photo below shows some assembled wagons almost exactly as they come, expect for the fact that I have levelled off the curved ends of the open wagons. As you can see, the little couplers are very unobtrusive and neat. The finished wagons are very light, so I add some lead weight under the floor in the form of lead sheet, 7mm square and about 1.5mm thick. this keeps the centre of gravity quite low. Any subsequent loads are kept as light as possible. 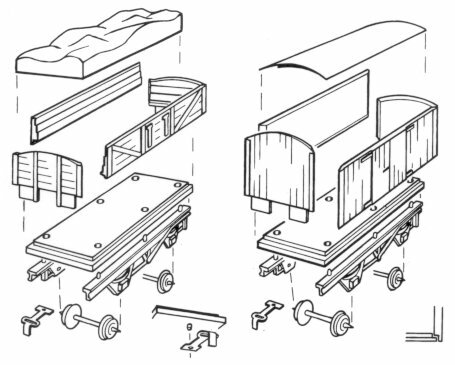 For a little variety, it's very easy to use the components to build up other types of wagons. In the photo below, from left to right, there is a brake van, made from the box van by adding some side and end windows, an oil tank, using the tank section from an N scale road vehicle kit and a 3-plank wagon, made by reducing the open wagon in height and altering the strapping on the side. Technically, the brake van is actually a "road van", so called because it still has some load carrying ability, whereas a brake van (caboose in US) does not. The next set of wagons are some ore hoppers. 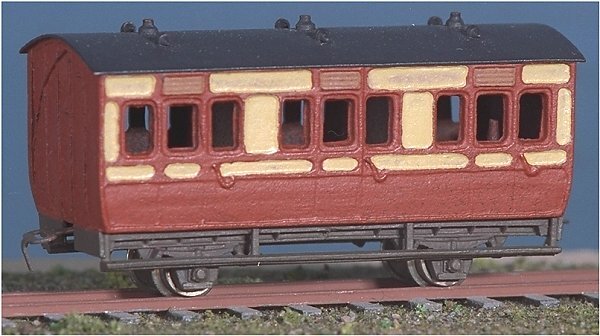 These use a cut down version of the chassis mouldings above and for the body, a container made by Fleischmann, which are actually a standard Deustche Bundesbahn container which normally sit in groups of five on a standard gauge wagon. However, they do make a neat little narrow gauge hopper on their own. The containers are moulded in a odd type of hard plastic for which I couldn't find a solvent, so assembly was by cyanoacrylate glue. Painting was quite fun. Each wagon was given a coat of very dark grey, almost black. Then it was dry-brushed with a rust colour. The end result seems quite effective. Right now, I only have one coach. This was built using some old plastic mouldings for a standard gauge coach which were produced by my good and much missed friend, Denys Brownlee, who was a genius at making his own injection mouldings using a very Heath-Robinson (US readers - substitute "Rube Goldberg" for "Heath-Robinson"!) looking machine which actually worked extremely well. The parts were cut and shut until a suitably sized body was acheived which suited the loading gauge. The running gear is a shortened Markin chassis with footboards added in styrene strip. Considering its mongrel heritage, it makes a convincing model. Looking at this photo reminds me that I must remember to dust models before photographing them. I've recently acquired some white metal castings by ZLT Limited Editions for some quarry wagons. These are one piece white metal castings, again without wheels. This time I have used some wheels I made some time ago, turned from Delrin or Acetal (I'm not quite sure which) using a form tool borrowed from Denys Brownlee. These wagons have inside bearing wheels so are not as free running as the others. Because of this, I shall probably limit the number hauled to a maximum of three. This won't necessarily be a problem as I'm planning to build a very small mineral railway diorama and the wagons are ideal for this. Soft castings like these can be made to look very battered. The photo was taken using a borrowed digital camera (Sony Mavica FD81). I'm a little disappointed with the depth of field so a little more experimentation seems in order before I finally decide to stump up hard cash to buy my own.